A “Healthy” home or building is designed to be Dry, Clean, Pest-Free, Safe, Contaminant-Free, Ventilated, and Maintained. Indoor air quality (IAQ) is a term which refers to the air quality within and around homes and buildings, especially as it relates to the health and comfort of occupants. Good IAQ is the quality of air which has no unwanted gasses or particles in it at concentrations which will adversely affect someone. Poor IAQ occurs when gases or particles are present at an excessive concentration so as to affect the satisfaction or health of occupants. IAQ problems can arise from many sources or contributors such as moisture, insects, pets, appliances, materials used in household products, furnishings, building materials, smoke and other sources, all of which affect your indoor air quality and become a health concern. By establishing the Building Performance of your home or office Indoor Air Quality Solutions, IAQS can isolate and identify the sources and contributors of indoor contaminants and establish a scope of work to correct or eliminate the sources and contributors to improve the indoor environment and indoor air quality, IAQ. Indoor Air Quality Solutions, IAQS will help you improve your buildings performance and provide source control; improved HVAC filtration, and the necessary ventilation required to dilute any identified indoor contaminants. 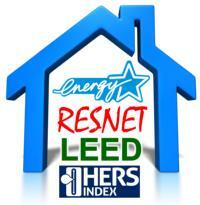 These are the primary methods for improving indoor air quality in most homes and buildings. Indoor Air Quality Solutions, IAQS seek to improve the performance and indoor air quality of existing homes and buildings by taking a comprehensive building performance approach to improving their indoor environment, indoor air quality, thermal comfort and productivity. Building performance initiatives address building systems (HVAC, appliances, office and household equipment, lighting, etc.) as well as operations and maintenance (O&M). Building owners, home owners, and potential purchasers and renters rarely have access to the information they need to understand the actual performance and indoor air quality of a given building and the opportunities for IAQ and building performance improvement. This information can motivate owners to upgrade their buildings, and help prospective buyers and tenants select healthier and more efficient homes and buildings. HVAC systems are comprised of the heating, air conditioning, and ventilation systems in a home or commercial building. These mechanical systems provide thermal comfort as well as control much of the indoor air quality in our occupied indoor spaces. Types of HVAC systems include air conditioners, heat pumps, furnaces, boilers, rooftop units, chillers, and packaged systems. A building’s HVAC system encompasses components such as ductwork and air handlers which are essential to system performance. Indoor Air Quality Solutions, IAQS inspects all aspects of the HVAC system and building performance to establish the preformance of your home or office and identify areas of possible improvement. New construction has many more opportunities for the integration of indoor air quality and building performance than existing homes and buildings. Often retrofits of measures like wall insulation are cost prohibitive for existing buildings but inexpensive for new construction. The opportunity to design a building with indoor air quality, building performance, and efficiently to begin with enables more and better efficiency measures to be incorporated. For these reasons, new construction is treated differently in indoor air quality, building performance, and efficiency analyses than existing homes and buildings. The more new technologies and practices that are adopted in new construction, the more costs will come down and the measures can become standard practice. In addition to "Green" building practices, important aspects of new construction involving indoor air quality, building performance, are garnering excellant feedback, and home buyer interest. 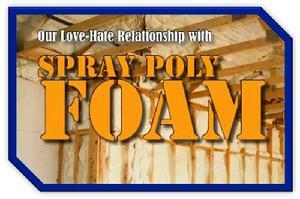 Spray polyurethane foam (SPF) is an effective insulation and air sealant material; however, exposures to its key ingredient, isocyanates such as "MDI," and other SPF chemicals that may be found in vapors, aerosols, dust or on surfaces during and for a period of time after installation may cause adverse health effects such as asthma. Therefore, steps to control exposures and safety tips should be followed. In the event you have concerns about odors that you believe may be related to the SPF insulation, you could contact your contractor and you may want to discuss the following: potential source(s) of the odor, that proper SPF installation procedures were followed, and a clean-up was completed. If you have concerns with your installed Spray Polyurethane Foam (SPF) Inspection follow the link to the SPF Inspection Page for additional information. Indoor Air Qaulity Building performance or home performance is a comprehensive whole-house approach to identifying and correcting comfort and indoor air quality problems in homes and offices. IAQ Solutions uses the National Center for Healthy Housing (NCHH) 7 Principals of Healthy Housing when conducting our IAQ Assessments. Indoor Air Quality Solutions, IAQS will use the newest industry technology to analyze your home or small business as an entire system, rather than multiple systems. Knowing what building performance and indoor environmental improvements to make and how they can work together to improve your indoor air quality requires special expertise. Indoor Air Quality Solutions, IAQS is equipped with specialized training and diagnostic tools to determine how your home or small business is performing, and can assist you in achieving your indoor environmental goals, whether it’s improving your indoor air quality or thermal comfort “Healthier Air Starts Here”.